Amazon offers the Dirt Devil UD20015 Upright Vacuum Cleaner for $28 with free shipping for Prime members or on orders of $35+. Also available at Home Depot. For a pricing comparison, you’ll typically find this sweeper for around $50. Today’s deal is the lowest price that Amazon has ever sold it for. Features include a “lightweight design”, cyclonic HEPA filtration system, bottom-empty dirt cup and a 8-foot stretch hose. While this model may not have as many bells and whistles as a Dyson vacuum, it’s also just a tiny fraction of the price. 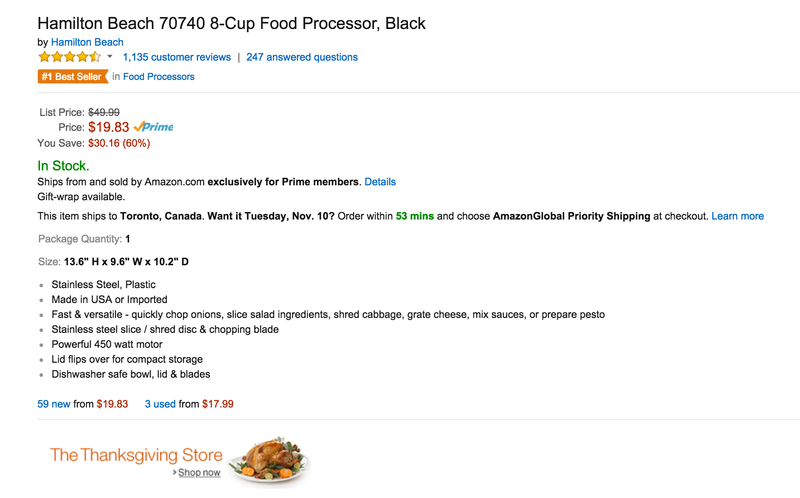 Amazon is offering its Prime members (only) the Hamilton Beach 8-Cup Food Processor in black (70740) $19.83 shipped (matched at Walmart with additional shipping fees). That’s $15 under the original listing, the lowest Amazon has offered it for and the best price we can find. Not only is it the best selling food processor on Amazon, but it has a 4.5/5 star rating from over 1,100 customers. Made of stainless steel and plastic, it can chop just about anything you stick in it with its 450 watt motor and dishwasher safe parts. Rated 4.6/5 stars from over 1,000 Amazon customers. Add two to your cart and use code MBLA4FYJ or..